'You want always go farther, higher!' Reproached me, years ago my (now ex) husband. He did buy me that to show it, on a highway in Yugoslavia one summer. The two cup trophy are from standup comedy clubs where I was voted first, after I begun comedy at age of 77 in London. The last one is from my Toastmasters club, after I was president a year, 2 years ago. And "Dr. Kertesz" made by my son at school, when he was 12, 33 years ago. 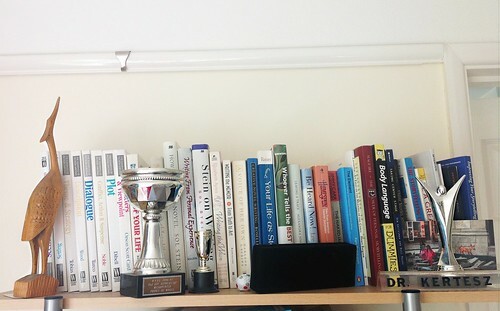 The books behind, some of my books to study writing, storytelling and comedy.